Monday was the first Nationals bobblehead giveaway of 2015. Two things: The Nationals have the greatest marketing team in Major League Baseball. 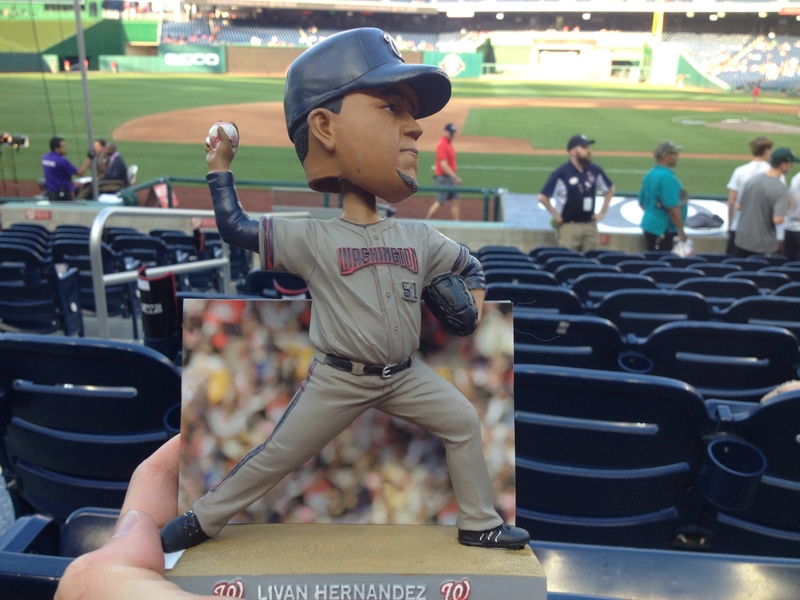 And Monday’s bobblehead commemorates Livan Hernandez’s first pitch in 2005, marking the return of baseball to D.C.. Hernandez also played for the Marlins in his career, so it was fitting that the giveaway happen at a game against Miami. In case you missed the photo post, all the good pictures I took Monday night can be viewed by this link. I got the Park around 5:40 while the Marlins were taking BP. There were relatively few home runs, and the Red Porch was crowded already. Unfortunately, Giancarlo Stanton does not make batting practice a daily home run derby. He tries to spray line drives around the field and only a few times unloads for long homers. That said, both he and Michael Morse hit homers beyond me in the Red Porch, and I wasn’t close to either. Joe was with me and he was wearing a floral print Marlins hat (above) that I bought him for Christmas. It’s something that only a kid like him could pull off. And it looks pretty snazzy. 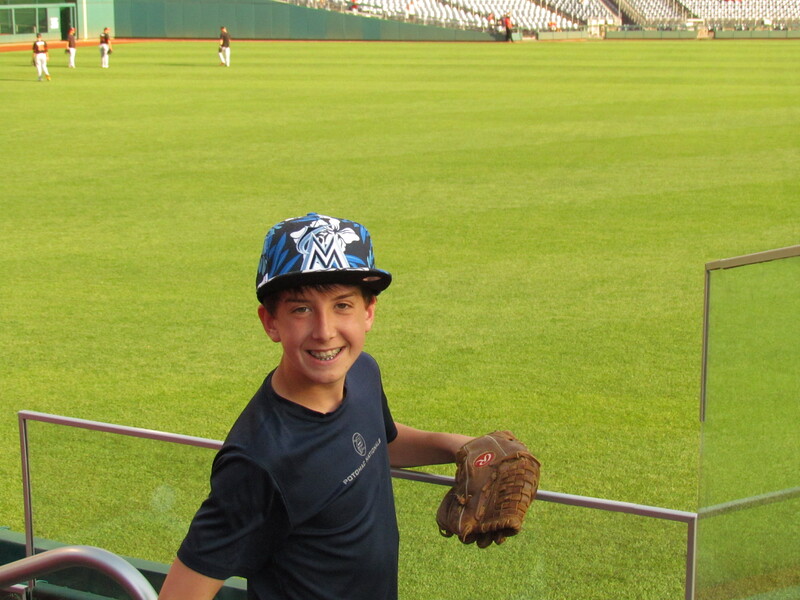 It benefited him about an hour later when we trekked over by the Marlins dugout as they vacated the field. A Miami player, who I think was Jarred Cosart, threw him a ball. A funny thing happened a few moments later when I saw catcher J.T. Realmuto emerge from the dugout to go warm up in left field. He was wearing the Miami gray away jersey, and since he was the first player out I assumed the Marlins would be wearing gray. Then more players came out, all wearing black. 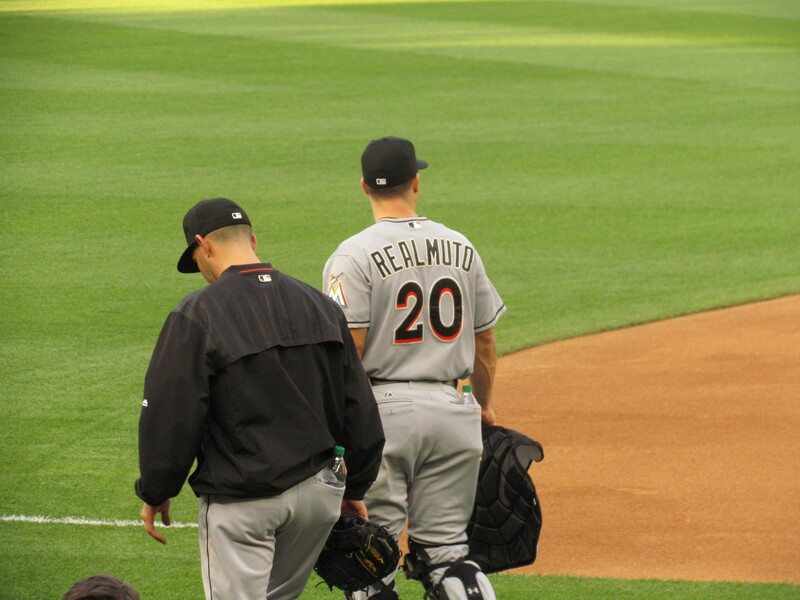 The next time I saw Realmuto he was wearing the black jersey. It must have been an honest mistake from the young catcher. 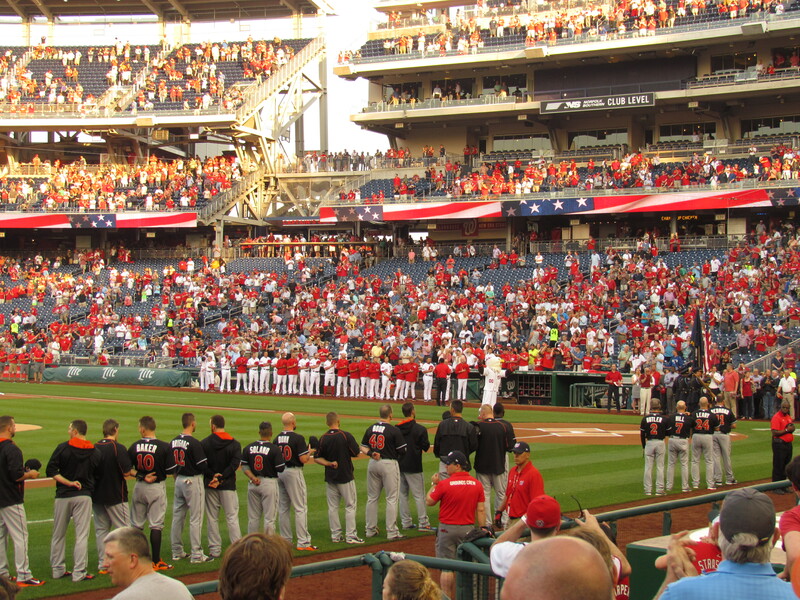 After the National Anthem, I remained behind the Marlins dugout in an empty row–an ordinary seat upgrading move. Uncharacteristically, the usher asked me for my ticket midway through the top of the first inning, so I had to get up and go to my real seat much farther down the line. I was still able to get a few good pictures of the first inning from my closer spot. 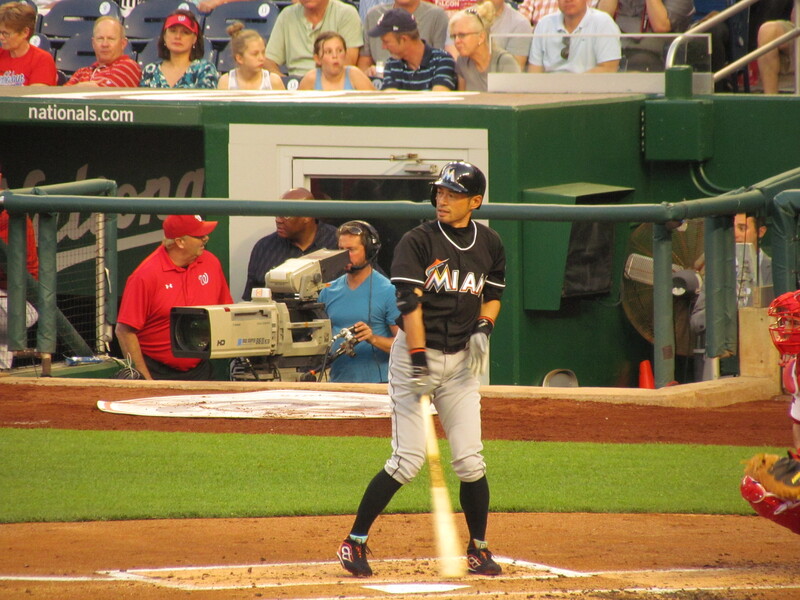 This was the first time, I believe, that I’ve seen Ichiro play in person. He did not disappoint, recording two hits and an RBI in the game. He did, however, get picked off in the second inning. The game itself featured Jordan Zimmermann and David Phelps pitching against each other. Luckily for the Marlins, it turned out a lot better than the last time Zimermann faced them at Nationals Park. Though, Miami’s bullpen spoiled a great start by Phelps. Both teams scored once in the first inning and went scoreless through the middle innings. In the top of the seventh, Marlins first baseman Justin Bour hit an opposite field homer off the top of the left field wall. Jayson Werth answered for the Nats in the bottom half of the inning. He drilled a two-out RBI single to center field to tie the game at two. 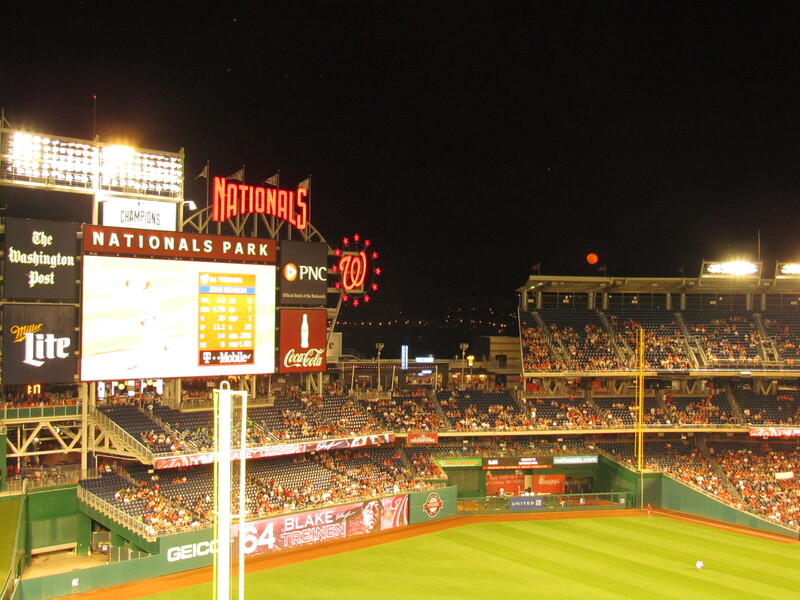 The timing was appropriate for the scruffy Werth as a large, orange moon rose above Nationals Park (see picture below). In the top of the eighth, Miami got two runners on for Jeff Baker, who punched an RBI single into right field. Later with the bases loaded, Ichiro chopped a grounder up the middle that Danny Espinosa booted, allowing another run to score to give the Marlins a 4-2 lead. In the bottom of the eighth, a lead off walk to Ryan Zimmerman haunted the Fish as Ian Desmond crushed a game-tying two run homer two batters later. The homer landed on the turf batters’ eye to the right of the Red Porch. Two fans hopped the rail from the seats and ran down to get the ball. They were promptly ejected from the stadium. I sure hope they got to keep the ball. Later in the inning, Yunel Escobar laced his fifth single of the day to right field, scoring two runs and giving the Nats a 6-4 lead. Tanner Roark, naturally, came in to pitch the ninth inning for his first career save. With one on and two out, he faced Giancarlo Stanton. After three consecutive balls, it looked to be a sure walk. But Roark snuk a fastball into the zone on 3-0, got Stanton to chase a 3-1 pitch outside, and then got him swinging on a 3-2 slider to end the game. The Marlins haven’t faired as well at Nationals Park over the past three seasons as they did in the previous four. They defeated Washington 2-1 Tuesday night, but that was just their 5th win in DC in the past 21 games. Hopefully they can get the bats going Wednesday for the series win. In addition to smond’s eighth inning homer, Marlins first baseman Justin Bour also went long in the gameDe. Joe and I were walking around the stadium at the time, but I did get to see the home run from the Red Loft in center field. Including those two blasts, the three I saw in Cincinnati last month, two by the Nationals last August, three I saw in Seattle last July, and David Ortiz’s blast in Boston, I’ve seemingly reversed the elusive homer trend my dad and I established. Back in the day, we’d often miss home runs when getting up out of our seats during games. Now, I don’t remember the last time I missed one. Finally, I was a bit bummed that Dan Uggla didn’t play in the game, but he did get the start at second base the following night. Final score: Nationals 6, Marlins 4. Here’s a bit about Livan Hernandez:. Livan Hernandez was one of the few players of baseball history that made memories for both Marlins and Nationals fans. In 1997 at the age of 22, he won nine games as a starter for Florida and was an integral part of their World Series championship. In 2005, he threw the first pitch in Nationals history. My lasting memory of Livan, though, has to be a game the Nats played in Cincinnati sometime around 2010 or 2011. He wasn’t pitching, but the Nats needed to move a runner over in the later innings. The manager summoned Livo to pinch hit, and he emerged from the clubhouse with untied cleats, putting his batting gloves on as he entered the batters’ box. A few pitches later, he laid down a perfect sacrifice bunt, jogged a few steps up the line, and let the pitcher tag him out. He turned and re-descended into the clubhouse to resume his presumable mid-day nap.